A transaction is a transfer of Bitcoin value that is broadcast to the network and collected into blocks. 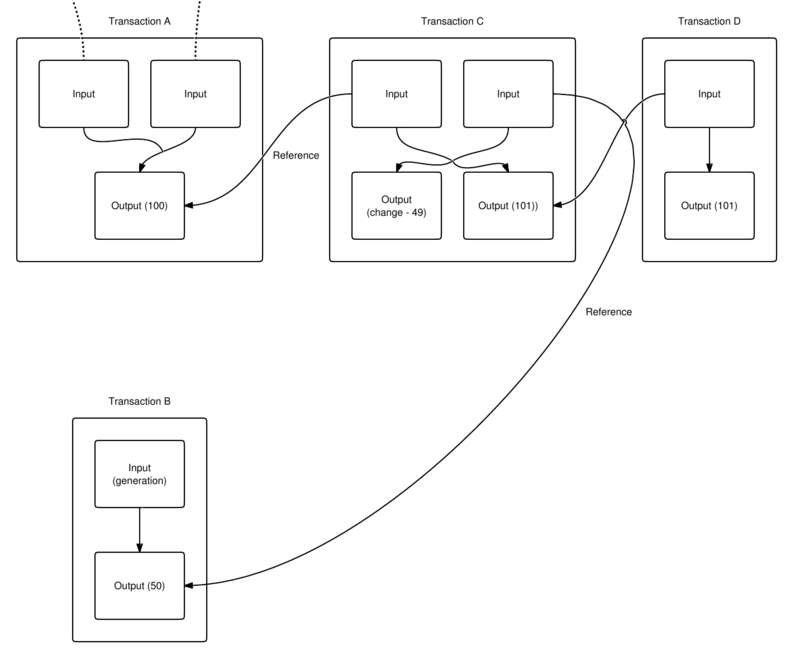 A transaction typically references previous transaction outputs as new transaction inputs and dedicates all input Bitcoin values to new outputs. Transactions are not encrypted, so it is possible to browse and view every transaction ever collected into a block. Once transactions are buried under enough confirmations they can be considered irreversible. Standard transaction outputs nominate addresses, and the redemption of any future inputs requires a relevant signature. All transactions are visible in the block chain, and can be viewed with a hex editor. A block chain browser is a site where every transaction included within the block chain can be viewed in human-readable terms. This is useful for seeing the technical details of transactions in action and for verifying payments. An input is a reference to an output from a previous transaction. Multiple inputs are often listed in a transaction. All of the new transaction's input values (that is, the total coin value of the previous outputs referenced by the new transaction's inputs) are added up, and the total (less any transaction fee) is completely used by the outputs of the new transaction. Previous tx is a hash of a previous transaction. Index is the specific output in the referenced transaction. ScriptSig is the first half of a script (discussed in more detail later). The script contains two components, a signature and a public key. The public key must match the hash given in the script of the redeemed output. The public key is used to verify the redeemers signature, which is the second component. More precisely, the second component is an ECDSA signature over a hash of a simplified version of the transaction. It, combined with the public key, proves the transaction was created by the real owner of the bitcoins in question. Various flags define how the transaction is simplified and can be used to create different types of payment. An output contains instructions for sending bitcoins. Value is the number of Satoshi (1 BTC = 100,000,000 Satoshi) that this output will be worth when claimed. ScriptPubKey is the second half of a script (discussed later). There can be more than one output, and they share the combined value of the inputs. Because each output from one transaction can only ever be referenced once by an input of a subsequent transaction, the entire combined input value needs to be sent in an output if you don't want to lose it. If the input is worth 50 BTC but you only want to send 25 BTC, Bitcoin will create two outputs worth 25 BTC: one to the destination, and one back to you (known as "change", though you send it to yourself). Any input bitcoins not redeemed in an output is considered a transaction fee; whoever generates the block can claim it by inserting it into the coinbase transaction of that block. Bitcoin currently creates two different scriptSig/scriptPubKey pairs. These are described below. P2SH addresses were created with the motivation of moving "the responsibility for supplying the conditions to redeem a transaction from the sender of the funds to the redeemer. They allow the sender to fund an arbitrary transaction, no matter how complicated, using a 20-byte hash"1. Pay-to-Pubkey-hash addresses are similarly a 20-byte hash of the public key. Pay-to-script-hash provides a means for complicated transactions, unlike the Pay-to-pubkey-hash, which has a specific definition for scriptPubKey, and scriptSig. The specification places no limitations on the script, and hence absolutely any contract can be funded using these addresses. The scriptPubKey in the funding transaction is script which ensures that the script supplied in the redeeming transaction hashes to the script used to create the address. In the scriptSig above, 'signatures' refers to any script which is sufficient to satisfy the following serialized script. Empty. 0 <sig1> <sig2> OP_2 <pubKey1> <pubKey2> <pubKey3> OP_3 OP_CHECKMULTISIG Only the scriptSig is used. 0 <sig1> <sig2> OP_2 <pubKey1> <pubKey2> <pubKey3> OP_3 OP_CHECKMULTISIG Constants are added to the stack. true Empty Signatures validated in the order of the keys in the script. This page was last edited on 22 February 2019, at 19:20.